For years, residents of the Four Corners have watched with various degrees of dismay or resignation as a smudgy haze has blurred the once-crisp vistas of the scenic region. But there is increasing pressure to change that picture. On Jan. 20, a coalition of environmental groups filed a lawsuit in U.S. District Court in Washington, D.C., charging that the Departments of Interior and Agriculture are dragging their heels about responding to previous petitions designed to improve the visibility in certain pristine areas, including Mesa Verde and Grand Canyon national parks. Also, the U.S. Environmental Protection Agency announced in October 2010 that it expects the Four Corners Power Plant, one of the region’s biggest polluters, to clean up its act by installing some $717 million worth of controls designed to cut its nitrogen-oxide emissions by about 80 percent. And the EPA wants to make the San Juan Generating Station, another coal-fired power plant in northern New Mexico, install similar equipment to slash its nitrogenoxide emissions. That proposal would cost an estimated $750 million. All this may mean big changes for the aging plants, Eisenfeld believes. “The big question is whether slapping some control technologies on a battered old facility is the answer,” he said. The first units of the 2,040-megawatt Four Corners Power Plant, which sits on the Navajo reservation near Fruitland, N.M., on the south side of the San Juan River, began operating in the early 1960s. The 2,250-megawatt San Juan Generating Station, which is at Waterflow, N.M., on the north side of the river, came online in the early 1970s. 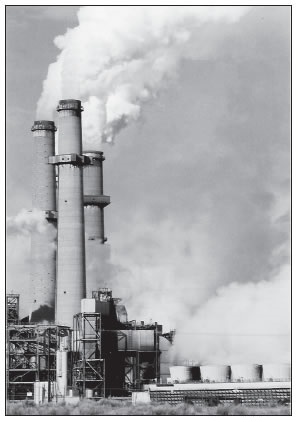 Another major contributor to pollution in the Four Corners area, the 2,250-megawatt Navajo Generating Station at Page, Ariz., began operating in 1974. According to the lawsuit filed against the Interior and Agriculture departments by the environmental groups, the Navajo Generating Station annually impairs visibility more than 0.5 deciviews (a visible measure of haze) at each of eleven Class I areas within 300 kilometers of the facility, including an average of 2.5 deciviews at least eight days a year in Grand Canyon alone. The Four Corners Power Plant annually impairs visibility more than 0.5 deciviews at each of 16 Class I areas within 300 kilometers and an average of 3.1 deciviews at least eight days a year at Mesa Verde, the suit alleges. Class I areas under the Clean Air Act are special areas such as national parks and wilderness areas whose air quality is deemed top priority. According to the National Parks Conservation Association, one of the groups filing the lawsuit, Class I park units near the San Juan Generating Station alone had more than 8 million visits and supported more than 18,000 local jobs in the Four Corners states in 2008. “Haze pollution, in contrast, is an economic deterrent, causing lost work days, lower productivity, increased labor costs and higher health insurance costs — as well as health impacts like asthma, heart attacks and premature death,” the NPCA states on its web site. Nitrogen oxide and sulfur dioxide, which are among the major emissions from coalfired power plants, are a prime factor in haze, as are particulates. According to the Environmental Integrity Project, the Four Corners, San Juan and Navajo plants rank No. 22, No. 44, and No. 49 among power plants nationwide (more than 350) for the amount of nitrogen oxide they release. Some rankings show Four Corners as No. 1 in nitrogen oxide. But haze certainly isn’t the only concern associated with air pollution. Nitrogen oxide and sulfur dioxide contribute to acid rain. Particulates – which are produced by power plants, diesel vehicles and woodburning cause respiratory problems. And ozone, a gas created through the interaction of nitrogen oxide, volatile organic compounds, and sunlight, is linked to respiratory conditions such as asthma. The Four Corners is close to exceeding the federal standard for ozone, something unusual for an area with such a low population. Another pollutant of concern is mercury, a toxic element released when coal is burned. Concentrations of mercury in rainfall monitored at Mesa Verde National Park are among the highest in the nation. The Navajo Generating Station ranks 29th highest in the country for the amount of mercury it emits, while the Four Corners plant is 38th. A study by the Mountain Studies Institute analyzed data from 2002-08 and employed modeling to investigate the source of the mercury at Mesa Verde. “The combination of evidence from the various analyses. . . lead us to conclude that coal-fired power plants south of Mesa Verde National Park are likely an important source of mercury in wet deposition to the park,” the report stated. But the coal industry has always pointed to the endless demand for electricity and the need for jobs as reasons to keep the power plants going. The Four Corners Power Plant and the BHP Billiton Navajo coal mine that feeds it reportedly provide close to 1,000 jobs, well-paying positions that are hard to find on the Navajo Nation. The plant pays some $60 million annually in taxes to the tribe, according to the Four Corners Business Journal. The San Juan Generating Station is the seventh-largest coal-fired power plant in the West and employs 400 full-time workers, according to its web site. The EPA’s crackdown on emissions has left the facilities scrambling to decide how to proceed and seeking extensions on deadlines to consider the proposals. The San Juan plant is already spending $320 million on an upgrade begun in 2006. Arizona Public Service, co-owner and operator of the Four Corners plant, has made a counterproposal to the EPA to shut down three units at the plant and install controls on the remaining two units to meet the new standards. The EPA extended the public-comment period on its proposal regarding Four Corners to March 18, 2011, to allow time to assess the alternative proposal, which APS says will result in bigger reductions in emissions than the EPA is asking and will save jobs. Four hearings are eventually supposed to be held around the region about the proposal, at Farmington, Nehnahezad, and Shiprock in New Mexico, and in Durango, Colo. Meanwhile, Public Service Company of New Mexico, majority owner of the San Juan plant, has sought an extension of the public-comment period on the EPA’s proposal regarding its facility, saying the issues involved are complex. An open house and public hearing regarding that proposal and the plant’s nitrogenoxide emissions has been scheduled for Thursday, Feb. 17, in Farmington, at San Juan College, 4601 College Blvd., Computer Science Building, Room 7103. The open house will begin at 3 p.m. and end at 5; the public hearing will begin at 6. The EPA’s recent proposals aren’t the only factor driving the power plants to change the way they operate. A California law that now bans that state’s utilities from making new investments in coal-fired electricity is complicating the picture. According to the New Mexico Business Weekly, Southern California Edison must divest itself of its 48 percent ownership of Units 4 and 5 at the Four Corners Power Plant by 2016, when the current lease with the Navajo Nation expires. Arizona Public Service, which owns 100 percent of Units 1-3 at Four Corners, has agreed to buy Southern California’s share for $294 million as part of its plan to close the three old units and upgrade the other two. However, the minority owners – who would have to help pay for the upgrades – still have the right of refusal, the New Mexico Business Weekly reported. And the Navajo Nation at press time had not approved a new lease with APS for the power plant. Lease extensions need to be approved well before the current lease ends in 2016 or the company will have to start looking elsewhere for power and decommissioning the plant, according to the Four CornersBusiness Journal. He said public hearings concerning the proposals should prove interesting. “The coal industry will be there saying these coal plants are so vital to the local economy, and we’ll say a real economy is dependent on cleaning up these facilities. The economy around here is greater than PNM and APS’s profits. The Navajo Nation had planned to become home to a new, cleaner coal-burning plant called Desert Rock, which was to be built in Burnham chapter southwest of Farmington. However, the $3.6 billion, 1,500-megawatt plant by Sithe Global appears more and more moribund. Under the Obama administration, the EPA revoked the air-quality permit it had granted to Desert Rock, saying there had been deficiencies in the analysis. The plant was rejected for stimulus funding that would have paid to add carbon-capturing technology to the facility, and the tax-free industrial-revenue bonds that had been issued by San Juan County, N.M., for the project then expired. Eisenfeld said when Desert Rock was proposed, no one was talking about shutting down the other two northern New Mexico plants. “They said they were going to be the third coal plant. If it’s on the table for Desert Rock to replace Four Corners and San Juan, that’s a whole different discussion. “When we brought that up in our scoping comments in 2003 [having Desert Rock replace the older plants], they laughed at us.” Eisenfeld is adamant that the older coalfired plants are a technology of the past and that, despite the cost to consumers, the facilities need to be cleaned up or replaced, preferably with more advanced forms of energy. “Coal is expensive when you think about the impacts to public health. The utilities still want to perpetrate the ‘national sacrifice zone’ concept in the Four Corners so everybody gets cheap energy in El Paso and California. But we’re done. We’re tired of it. “Hundreds of miles away, they don’t care about the impacts to our public health.” Furthermore, the impacts to tourism and the area’s parks need to be considered, Eisenfeld said. “We should have the most pristine air in the country. Are the people in Cortez deriving a lot of benefits from the San Juan Generating Station, or Four Corners? What benefits are there to visitors to Mesa Verde other than to be disgusted when they try to enjoy the view?